Inspired by a post on Ulthuan (Boo! Hiss!) and that I may have to face this guy tomorrow in a comped practice game, how do you guys all feel about the Karl Franz Ascendant? Basically: flying 4+ ward mr(2) monster with 9 wounds, 10 attacks which wound automatically, ignore armor and inflict d3+1 wounds each. Bolt throwers may get 1, maybe 2 rounds of shooting at him. On average, even if on short range, you barely inflict 2 wounds per turn. Magic cant really touch him through the 2+ ward save, and while witch elves will in theory mop the floor with him, he flies and can pick his own battles. He is ItP and stubborn, so shoving a large amount of CR down his throat will do no good either. The Ulthuan post seems to be boiled down to three options. 1. Test or die spells. This seems to be the king way, but again, 1 in 6 chance every time. And considering he flies, likely has a dispel scroll on his side, you may get to cast it once. And you may not even get that. Then he is in your face. 3. Arcane unforging. Hey wait, we dont have that! Then there is the hidden 4th option. Malekith has the Destroyer, and so has 1 in 4 chance to destroy his magic weapon with ASF. If he fails, he will die and everything is lost. If he succeeds, he will tank KFA down and slowly kill him. Comments and thoughts? I am not one to whine too swiftly, but this monstrosity seems like genuine BS. Own edit: Sorry didn't realize it was such a bad word. Will control my outrage more carefully in the future. Last edited by Thraundil on Sat Nov 08, 2014 5:21 pm, edited 1 time in total. Shadow magic, Warlocks + lots of shooting. Hit him with Withering and/or Soulblight and your shooting suddenly has the ability to hurt him more reliably. Try to strip away a few wounds with shooting, charge him with something and then 6-dice Mindrazor. The idea is sound... Only its a comped environment. So I can max use 4 dice on mindrazor, and warlocks are expensive. And then the issue becomes that he only has to fear the one spell... And its a fair deal of tailoring to do so :p there are other army types which would just shrug at a DE shooting list :/ the "counter" to KFA needs to work all-comers... Its a tournament list. One variant of #2 - In the olden days (1998, so what is that 4th?) my go to strategy against a repeat opponent's Verminlord was an expendable minor hero with the Black Amulet and resurrection (I think High Magic via the Crown if Ashur). You'd tie the Verminlord up and each turn it would do some damage to itself, and two or three turns later it was dealt with on most occasions. Checking the changes though, with the cheapest heroes removed, and the Black Amulet priced up so only Dreadlords can take it... I'm not certain the maths is on our side anymore. Maybe alternate challenges by a cheap champion and the resurrected Dreadlord next to one another, but there's so much that feels like it would go wrong. Even in writing this, I feel I've kind of ruled it out to myself, but I'll post regardless in case someone else can add a cunning twist. The idea is sound... Only its a comped environment. So the event you are prepping for allows Karl Franz Ascendant but is capping magic at 4 dice per spell ?!?!?!?!? Honestly, I would not attend such an event. we don't care about armour ignored; as long as 5 remain they are stubborn. If there are enough small WE units, chances are that AKF can only charge them. Wondering about the mathammer, but 6 WE units might be enough to tie him up for the whole game. And they are far from useless the rest of the time. Between regular attacks and Thunderstomp Karl Franz should kill or break a 10-strong Witch Elf unit in a single combat round (2 if you have a champ to challenge and hold him up). Got a model to represent Malekith? Destroy his weapon round 1 and Karl's toast. All magic is 5 PD max, but all death spells and specifically mindrazor is 4 PD max. Fair or not is a matter of judgement and preference I guess... I dont like that mindrazor is a 50/50 to cast, but I also dont like how incredibly powerful mindrazor is. But then again, KFA is allowed so... I dont envy the guys writing the comp pack, trying to balance out everything. Small WE units will certainly do the trick - eventually. KFA is I7 so they will hit him on 4's without rerolls, and wound him on 6's... 16 attacks, 8 hits hereof max 2 poison and 1 further wound... Would be lucky to inflict a wound on him without magic assistance, and then he'd wipe the unit out most likely. And the biggie... He flies. Why would he charge witch elves when he can charge whatever's behind them. I do have a representation of Malekith yeah... And he's on a cold one with 3 master bodyguards and a lvl 2 as well to ensure Mal gets the spells he needs. I think I may eventually drop the idea as it feels too fragile, though, and go for a more of a 'standard' build. And the issue is... First off, destroyer is only 50/50 to actually destroy a magic item. And then, its 50/50 between KFA's ward save or magic weapon. If he loses the ward save, he still kills Malekith... Meaning 1/4 Malekith wins over him, and 3/4 Malekith dies. In 1/3 of the situations in which Malekith dies, the masters + warlocks then have one shot at killing KFA before he wipes the lot of them. In the last cases, he ALSO wipes the lot of them without chance... I dont like those odds one bit, let me tell you. He flies. Why would he charge witch elves when he can charge whatever's behind them. He can fly over WE but must land somewhere. If there is not enough space between WE and next unit, he cannot charge next unit and if he positions without charging, then that's 1 turn when he did nothing. Also, the MSU concept means that behind the WE, chances are that there's another unit of WE. Of course Mindrazor is powerful ... but when you effectively take it out of the game you skew it a different direction. I understand that people don't like it when their expensive character or deathstar gets worked over by Mindrazor or some other "6" spell. But they need to understand that I don't like it when my entire army gets smashed by a deathstar that I have no answer for because magic is nerfed. I would not attend an event with this type of restriction on magic. Well, the rationale seems to encourage deathstar vs deathstar and may whoever has the biggest win. I understand that some people like that. What about an emergency unit of 5 harpies with the WE's to intercept and interfere if he strays from the intended chaff? Try 2 peg-mounted Dreadlords. One with lance, Black Amulet and Other Tricksters Shard, one with Cloak of Twilight, lance, and Potion of Foolhardiness. Using Druchii logic, I'd be sneaky and bring along Sivjar's Hex Scroll. When Karl Franz casts his bound spell, pull out the scroll. Because he has no wizard levels, he would automatically turn into a Frog. I'd then 6-dice a death snipe and take off, on average, 8 wounds. I'm sure between shooting and whatever else a Dark Elf army can muster, we'll find a way to take off two more wounds on a T1 model the size of a house. The relevant portion of the book to verify this is legal would be on page 28 under the paragraph "Wizards". In Warhammer, everything has a counter to it. Another possibility would be feeding him with units with champions - raised by lore of undeath and thus awarding 0 VP. First turn, you charge him with fast cavalry (six strong with champion) and hold on steadfast; in subsequent turns, you should be able to prepare at least one undead unit to countercharge. Which will not run away after its champion gets destroyed. It would cost you your entire magic phase but you would take him out of the game for the cost of one fast cavalry unit. Not sure if there are enough spells raising a suitable unit, though. 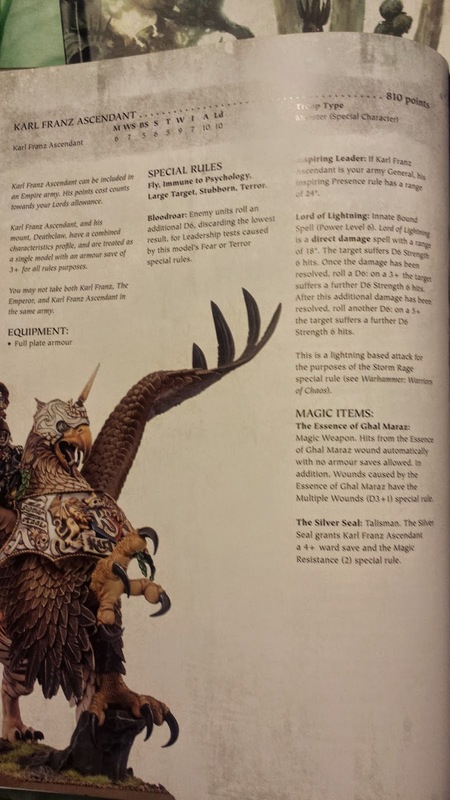 While this is brilliant, Karl Franz Ascendant's spell is an innate bound spell and it is possible that KFA is not a valid target for the Hex Scroll. BRB p37 states that "Possessing a bound spell does not make a character a Wizard - he just has an item that can cast a spell." The Hex Scroll's fluff refers to the energy of the spell being redirected at the caster, but then makes reference to the "the enemy wizard" having to roll equal to or under their wizard level. Since KFA is not a wizard, it's arguable that he's either (1) automatically turned into a frog because he has no wizard level, or (2) not a valid target for the Hex Scroll because he isn't a wizard. Unfortunately, it's not as clear as the Feedback Scroll, which uses capitalised terms properly. Clearly, GW needs a trained lawyer in their rules department. I think there are reasonable arguments each way. That said, if I were running a comped tournament and someone took KFA, my view would be that they deserved to have the rules interpreted so as to reduce the stinkiness of this particular piece of cheese. What you're referring to, Haagrum, is if a character model was using an item that has a bound spell (ie. the Ruby Ring of Ruin). Karl Franz Ascendant has an innate bound spell and as such qualifies to be a wizard. Respectfully, Phierlihy, that is not the case. The "Bound Spells" section of the rules specifically state that possessing a bound spell does not make a character a wizard. An "innate" bound spell is only really different from a regular bound spell when it miscasts, based on the source of the spell (i.e. from a magical item or an ability of the model). Using the same logic you have employed, a player could Hex Scroll a Runelord with the Anvil of Doom (if anyone took it), a Warrior Priest or the Cauldron of Blood. None are wizards per se, and all have innate bound spells. Don't get me wrong, I want you to be right about this, I really do. KFA is a nasty piece of work. However, the rules do not support the conclusion that a model with one or more innate bound spells is a wizard, and as such, there is an argument that he is not a valid target for the Hex Scroll. Last edited by Haagrum on Sun Nov 09, 2014 4:59 am, edited 1 time in total. Haagrum raises a valid point. If we played Storm of Magic, AKF would not occupy a fulcrum. At minimum, what is certain is that the rules leave enough ambiguity for the Empire player to contest the use of that scroll. At minimum, what is certain is that the rules leave enough ambiguity for the Empire player to beat you repeatedly around the head with his 512 page BRB until you cry. Well, that and page 48 of the Glottkin rules book. Some magic items, often rings and amulets, and certain troop types, have the ability to use a form of magic called a 'bound spell'. Bound spells can be used even if the bearer has broken his concentration or is not a Wizard at all. Possessing a bound spell does not make a character a Wizard - he just has an item that can cast a spell. Karl Franz has no item that casts a spell so I don't believe this applies in any way. His spell is innate like that of a Warrior Priest.